Anyone who has lost a pet knows it's like losing a beloved member of the family. The grief that follows is a natural process that you must go through. It will differ for everyone, some may go through it quickly and others may have a tougher time. There are resources for the grieving pet owners, websites, books, forums, and counseling, but often a friend just knowing what to say and more importantly what NOT say can be the the kindest act. The pet owner may not think that is the case. Chances are that they think the "better place" is here with them. 2. How old was he? Seems like an honest question, but somehow it may feel like the amount of grief is dependent on the age of the pet. Young dog...tragic. Old dog... to be expected. But the grief they feel will not matter the age of the pet. It is natural to want to empathize through sharing similar experiences, but at this time they will not want to hear your tragic story. They just want a friendly ear. Pet owners have to make healthcare decisions based many factors including their beliefs in treatment, availability of medical support and financial ability. The treatment plan may not have been your choice, but now is not the time to address them with the heartbroken owner. There is no benefit to second guessing. This may be a good recommendation, in it's right time, but a pet cannot be "replaced" and this is not the time to make the suggestion. The owner needs to go through the grieving process (whatever the time frame maybe) before they can open up to another pet. 1. I’m so sorry for your loss. A simple, heartfelt sentiment that acknowledges the pain they are in at this time of loss. Sharing something sweet, touching, and memorable about the lost pet will sure to bring a smile to the owner. Giving the owner permission to feel the way they are feeling is a gift. Grief does not work on a timeline. It can come and go, with some days being better than others. 4. Offer something in memory of the pet. 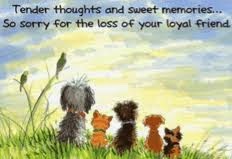 A donation to their favorite rescue, a candle lit in memory on Rainbow Bridge, posting on a pet forum, simply a card acknowledging the loss.